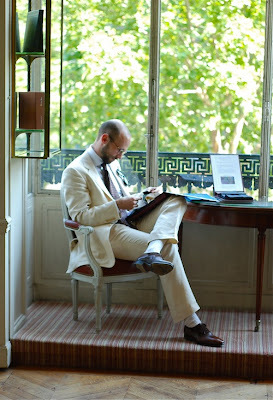 Parisian tailors differ in some interesting ways from English tailors. An apprentice cutter has to learn tailoring to the same level as his cutting, for example. Most of the tailors are full-time employees, not freelance. And they are all situated on the first floor of their buildings, rather than the ground. At Camps de Luca, this is a particular benefit, as the corner location on Place de la Madeleine affords a beautiful view across the square. Full length windows frame the trees and traffic outside, and natural light floods in. The only disadvantage is heat – on particularly steamy days the tailors are apparently instructed to work at home, rather than slowly boil inside. Although on the day I visited, and took advantage of the lovely position to browse through some cloth books (below), it was 32 degrees and still pretty comfortable inside. Another thing that differentiates Parisian tailors is ready-to-wear clothes. Most introduced them at the end of the last century as a defence against the swamping of designer brands, and while the scale varies considerably between Stark’s suits and Smalto’s multiple luxury collections, they still retain them. Camps de Luca is an exception; it has no ready-to-wear. But its bespoke casual wear still sets it clearly apart from its English peers. Our friend Wei Koh at The Rake has exhibited casual pieces made for him by Camps de Luca in that magazine, including a beautiful navy pea coat. And shown here are two examples from the current rails in Paris. 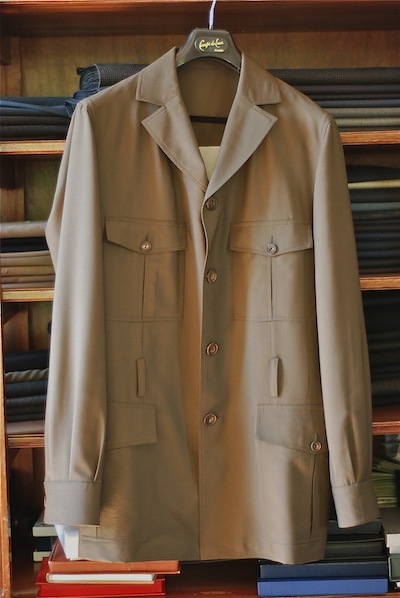 First is a safari jacket, of which multiple examples have been made for a longstanding client. In a high-twist wool, it is light but substantial – and the leather-backed belt was made strong enough to support ammunition and other hunting requisites. 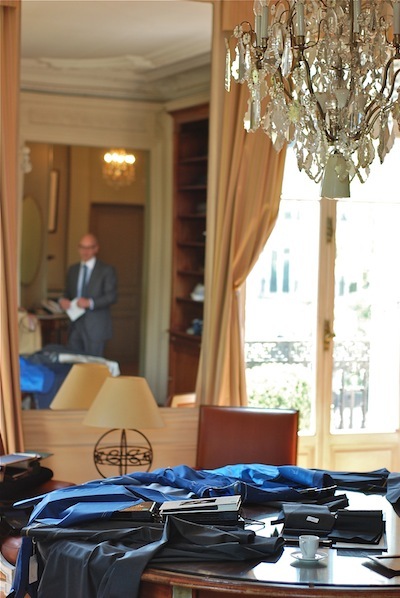 Camps de Luca, like many Parisian tailors (particularly Smalto) has many clients from French-speaking Africa and the Middle East, so safari shirts/jackets and lightweight suits are a common order. Indeed, Julien de Luca commented that the light weight of some of the suitings is becoming ridiculous. “We can only reduce the weight of the canvas so far, after all,” he says. “And with pocket bags on the hips and chest, the weight of the cloth really only makes a difference to the back of the jacket.” One cloth merchant in particular was apparently keen to push a very lightweight suiting, only to admit that it couldn’t use it in its own suits because it couldn’t find an appropriate canvas. Julien, grandson of co-founder Mario de Luca, has spent the past few years going through an apprenticeship at the firm. Although 32, he has only recently returned to the family firm after an education in England and working in the City in London for 10 years. “My grandfather encouraged me to leave the business and find something some stable,” says Julien. “Tailoring in France was not in a good way back then.” Julien’s consequently perfect English makes conversing on the finer points of tailoring very easy; though the English accent feels slightly anomalous. The second example here is not a finished piece but a basted fitting. The blue leather was scrap material, used to get the right fit before moving onto the desired brown crocodile. Apparently the final piece required 23 different skins. Interestingly, another difference between French and English tailors is the use of scrap material for initial fittings. Cifonelli does it on occasions, Camps does a fitting with a canvas and then one with a scrap cloth, and Smalto has a regimented system of sized plastic patterns, used to create a rough first fitting that it then alters to create a paper pattern (which Francesco Smalto created while at Camps). More on that another time. Many thanks to Julien and Marc. You can follow the discussion on Camps de Luca by entering your email address in the box below. You will then receive an email every time a new comment is added. These will also contain a link to a page where you can stop the alerts, and remove all of your related data from the site. Simon, thanks. Always a pleasure to read your post and a nice snap. Any idea about the price range at the establishment? Yes they are among the most expensive – starting at €6500 for a suit. Fantastic work though. The starting price you mention is striking because it would suggest rampant inflation (higher demand?) at Camps de Luca of late. I paid mine 5900 euros one year ago, and a buddy of mine paid his 5500 euros one year before me. As such, Camps de Luca has always been, and remains, the most expensive bespoke tailor in France — I guess that’s justified, as many bespoke tailors have been jacking up their prices recently and Camps de Luca remains IMHO the best bespoke tailor in France, bar none. The signature Camps style, sometimes referred to as ‘le cran parisien’, is oft copied but never equalled. That’s what led me in the first place to order a Camps suit, despite the hefty price tag — once you know the Camps de Luca notch lapel, you can’t mistake it for any other worldwide — and mysteriously, to this day, no other tailor is producing a decent Camps look-alike. Any idea as to what a safari jacket (tending more towards a shirt jacket) might cost? On another note, I have hardly been able to come across DB jackets with peak lapels from camps de luca. Is there a reason as to why this is so ? (I ask this in comparison to the multiple Cifonelli DB jackets with peak lapels which are easily found).